trash: The Corp cannot rez more than 1 piece of ice for the remainder of this run. Use this ability only during a run. "No! Don't set that off HERE!" Can the Corp rez any pieces of ice after the Runner uses EMP Device if the Corp has already rezzed ice during the run? 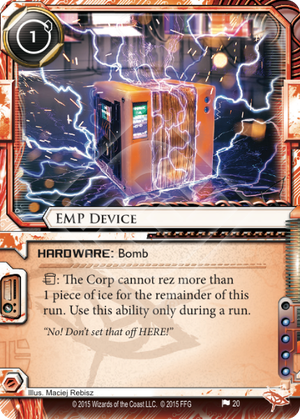 Yes, EMP Device only restricts how much ice the Corp can rez from the time it is used until the end of the run. After the Runner uses EMP Device, the Corp rezzes Howler. Can Howler’s subroutine still install a bioroid behind itself? Is the Howler still trashed? Howler installs the ice but does not rez it. Howler is not trashed, as it says “if you do” install and rez the ice. Can the Runner use a second EMP Device during a run after having already used one in order to trigger incidental abilities, such as Armand "Geist" Walker and Tech Trader? No, as the Corp is already precluded from rezzing more than one piece of ice for the remainder of the run, the second EMP Device would not change the game state and thus cannot be used. Pure and simple glacier hate. For me this thing is a card 45; I don't know about you, but when I build a runner deck I like to include a tiny janky trick to help throw the opponent off balance and gain momentum. This card is that sort of trick. Not a game plan but a destabilizer. Detonate it before you encounter the first ICE of a 4 deep glacier and well your Faust will probably take you through the one ice they are able to rez. Keep in mind they can rez 1 ice AFTER you blow this, so you need to pop it upfront to get maximum exposure. What this card is doing mechanically is preventing the corp leveraging their assets. They can have 30 creds more than you, but say you have this and Film Critic around, there will be very few ways for the corp to leverage their 30 credit advantage to touch you while you can run on a wing and a Faust with only a fistful of creds around to detag if need be/pop that one ice you'll be facing. 1. Keep it hidden in hand, harass their centrals, let them think they have a scoring window behind their glacier, then pop the bomb down on click 1 detonate and run click 2, loling as your Faust gets you through the 1 ice of their glacier they are able to rez. Crescentus that 1 ice after breaking for bonus points. 2. Put it down early. Make them panic, keep their agendas in hand, or stuffed in archives- Hades Shard or Legwork for the win. As of writing ( 30/03 in the year of our lord 2016) this card isn’t particularly relevant as net-runner’s meta is more horizontal than a limbo contest in a brothel. No, right now my utility pick is not this card.